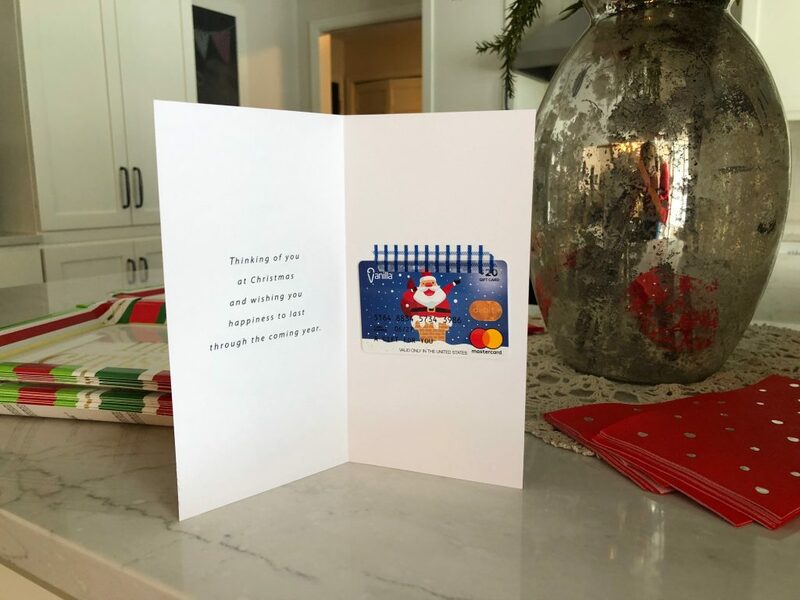 We frequently purchase gift cards at our local Walmart, including these Vanilla MasterCard Charming Characters Multi-Pack $20 gift cards that I used in the cards (pictured below) for our random acts of kindness. For every Vanilla MasterCard Gift Card purchase until 12/23/18 participants will be entered to win one of over 100 different prizes, including a grand prize of a $10,000 Macy’s shopping spree! To enter, after purchasing your gift card, go to https://www.winner-wonderland.com/ to enter. 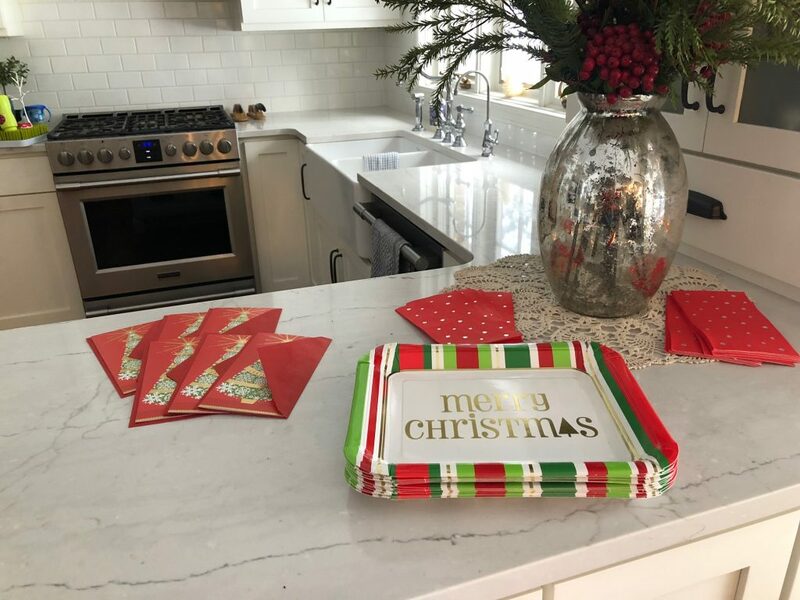 Christmastime, and the month of December, really, is a time when adults have plenty of Christmas parties and events to attend, but a little person Christmas party? 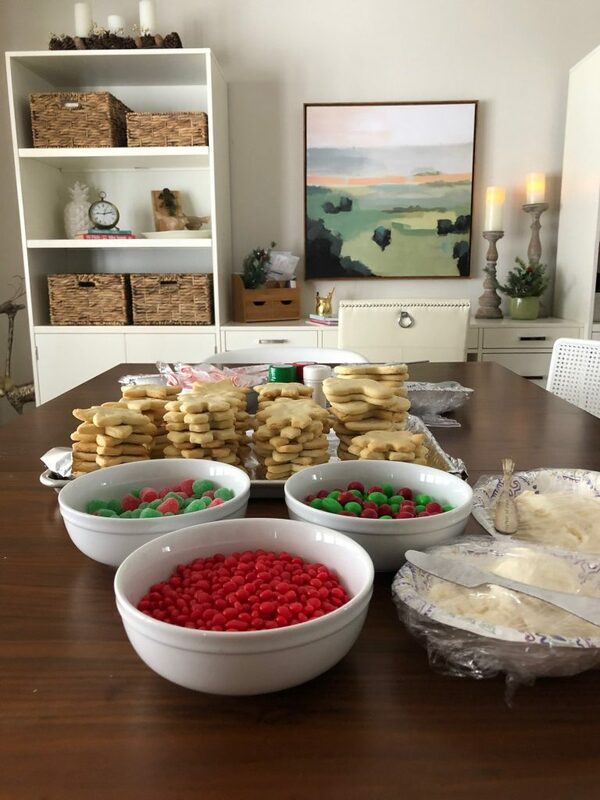 Well, we decided to tackle that this weekend with a few of our favorite little people and their mommas for a Preschooler Random Acts of Kindness Cookie Decorating Party! 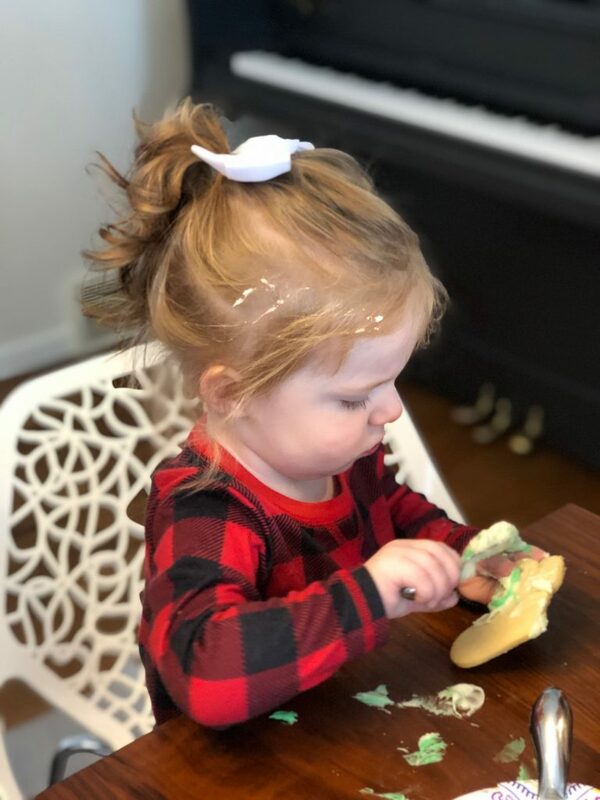 If you’re thinking that toddlers and preschoolers decorating Christmas cookies with sprinkles and frosting sounds like a hot mess, then you’re right! 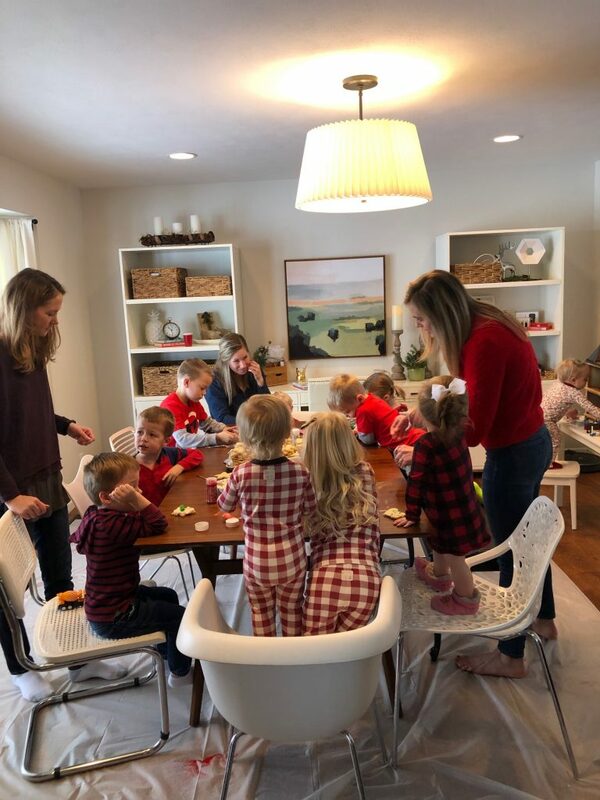 It was a bit crazy (as pictured above) but we also had a great time on a cold and snowy Saturday decorating cookies, drinking coffee (the moms) and listening to Christmas music while the kids played. -Lately Joe and I have been really conscious that we want Ainsley and Collins to grow up thinking about others rather than becoming super self-focused, so when I was approached about partnering with Vanilla MasterCard Gift Cards to find a creative use for gift cards this holiday season, I immediately thought about how they could be used to make someone’s Christmas a bit brighter! 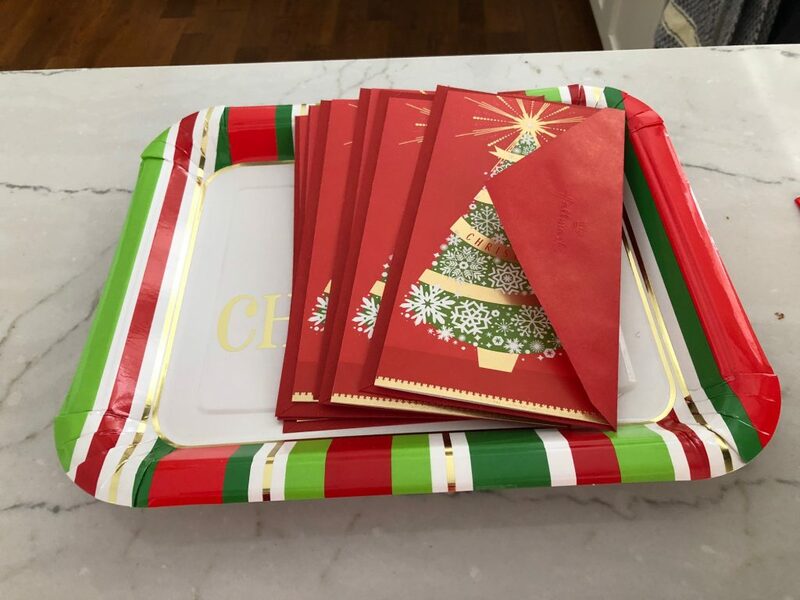 Each family who came to the party left with a plate of decorated cookies and a card with a $20 gift card in it to deliver to someone as a random act of Christmas kindness! -We knew it would be a mess letting littles decorate cookies, so we decided to put down plastic painter’s tarp under the table. It was a great idea because all we had to do was wrap up the tarp after the party and wipe down our table and clean-up was a breeze! 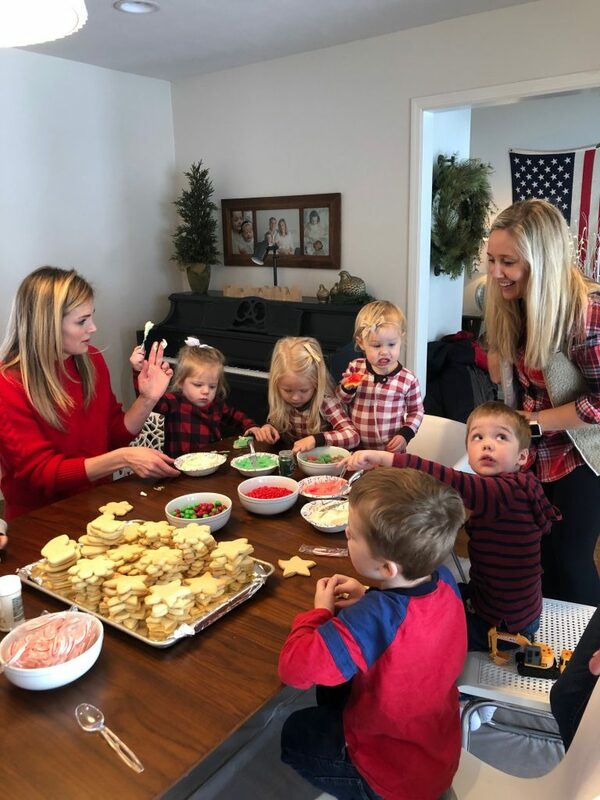 -Let’s be honest: The mom’s ended up decorating a lot of the cookies after the first 15 minutes, when the kids lost interest and started playing with toys, but any excuse to get together and celebrate the season is a win in my book! -If you want your cookies to look good and cohesive, stick with a color palette. 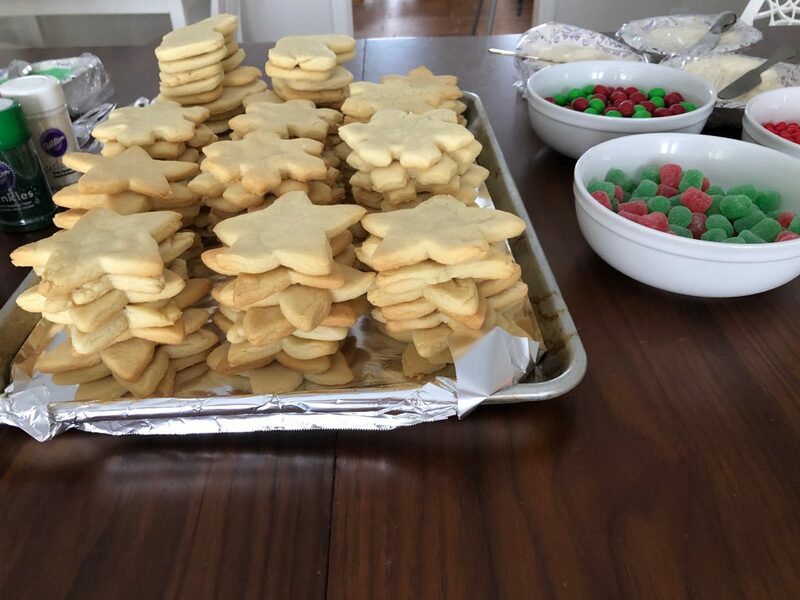 Even cookies decorated by little people can look good when you stick with a color scheme (we did red, green and white) that makes everything look cohesive. Another idea would be blue and white. Or white with gold and silver sprinkles. Or white and red. Plus, it’s easier to plan around, too! We had such a great time and it was a tradition I would love to continue every year! Plus, knowing that the cookies and gift cards when to brighten someone’s day make it even more special. With so much focus on ourselves and our own loved ones this holiday season, it’s nice to shift the focus to those around us more often. Hi friends! Checking in today with the first of a few holiday gift guides. Today, I’m sharing some of my favorites for the preschooler-aged kiddos in your life. 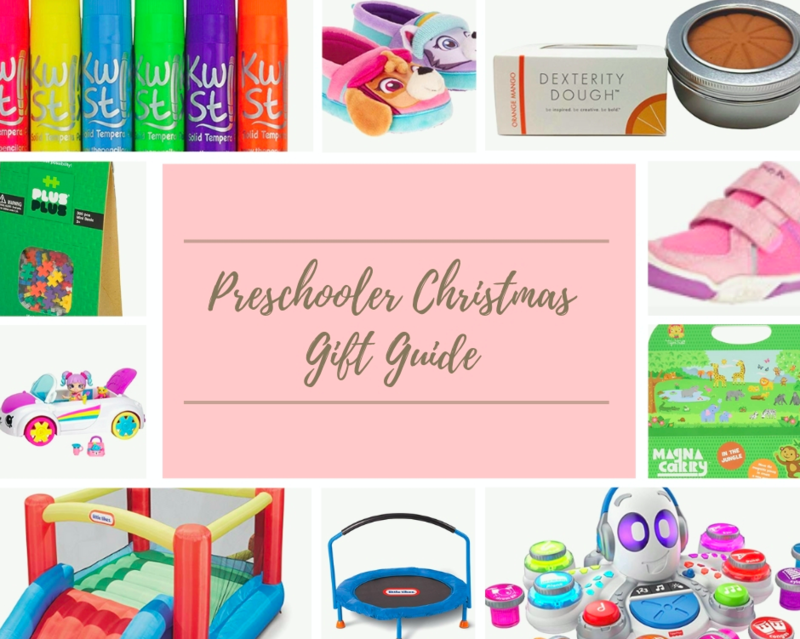 All of these items we have used/purchased/loved and/or have firsthand experience with using so I can vouch that if your kiddos are anything like ours, they will love these gifts! That said, this is geared more toward Ainsley’s age rather than Collins’s age, though Collins certainly plays with most of these toys, too! Here are some of our new favorites! We were gifted this as part of a campaign I worked on with the brand, and I’m so happy to say that the girls really have loved playing with this toy from Fisher Price. It allows you to mix and match the little plugs to create different instrument sounds and both Ainsley and Collins have enjoyed it. My dad gifted these building pieces to Ainsley when we celebrated early family Christmas this year and she has been having so much fun building and creating with these little interlocking pieces. The come in a bunch of colors and are so fun to use! 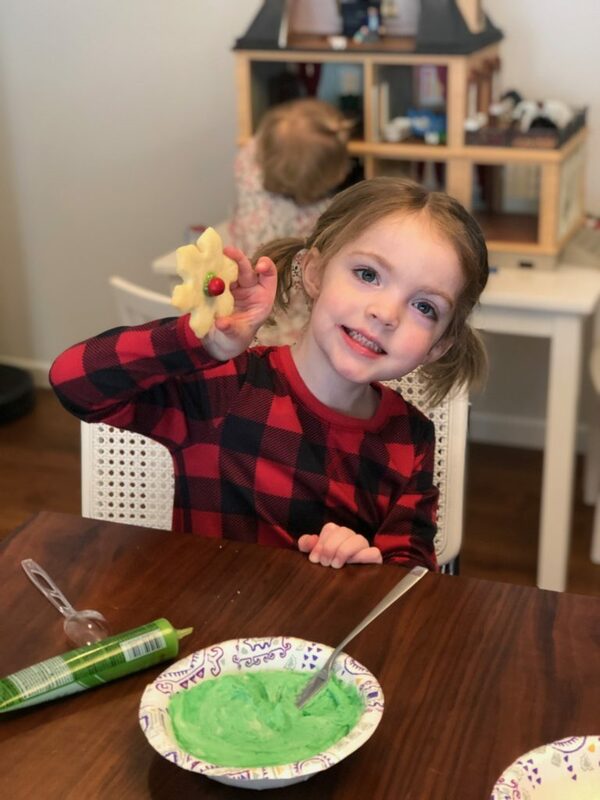 Ainsley got this from my mom as a safer, more user-friendly Play Doh and it’s awesome! It’s made without any artificial fragrance and or petroleum and smells like oranges! A less-messy alternative to painting, these have been a favorite in our house for a while. They almost feel like writing on paper with lipstick, and they dry quickly so you don’t have to worry about the typical mess associated with traditional paint. Ainsley gifted this to her cousin, Lottie, for her birthday and then got one herself for Christmas from her aunt (we celebrated early with my side of the family) and it’s been a hit in our house! The Shopkins craze is something I’ll never understand, but preschoolers love them! We have bought Ainsley a pair of Plae shoes for the last 4 or 5 seasons and she loves wearing them. We got her this very pair for her next size up. They are so comfortable, wear well and are cute enough to go with most outfits – casual and dressy. So great for keeping little hands busy in church, in the car, etc.! We finally did it! We bought a bounce house for the girls to keep in the basement. I promised myself last winter that I wouldn’t go another winter without a bounce house for the basement. So excited to see their excitement about this! Another solid choice for getting wiggles out in the winter months! Ainsley has these, she loves these and she wears them all the time! These two little people? They are the best little humans around. 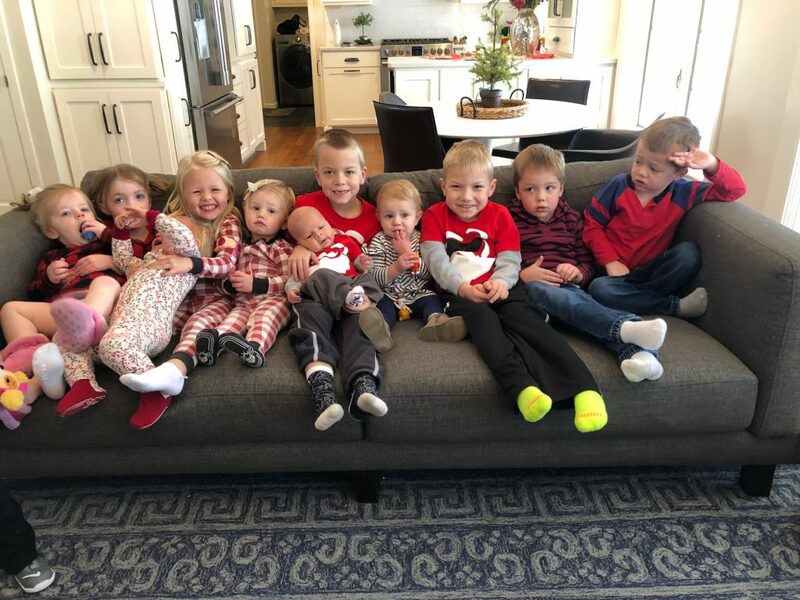 I love that they are spunky, fearless and bold and these qualities are things I have no doubt will serve them well as they grow older if we can successfully harness and direct them in the right way. But in the trenches of parenting tiny people, it can be a challenge to not get caught in the comparison game. Why are my kids not content to sit through an entire church service playing quietly and reading books? Why does sitting through a meal in a nice restaurant feel like torture most days? Am I doing something wrong? Do parents of quiet, mellow children know something I don’t? Sometimes it can be emotionally draining and overwhelming as a parent, can’t it? But you know the funny thing? In my heart of hearts it doesn’t really bother ME at all that my girls are this way. They are kids. Vibrant, funny, normal, energetic little people and I love their zest for life and budding desire to assert their independence and wills. 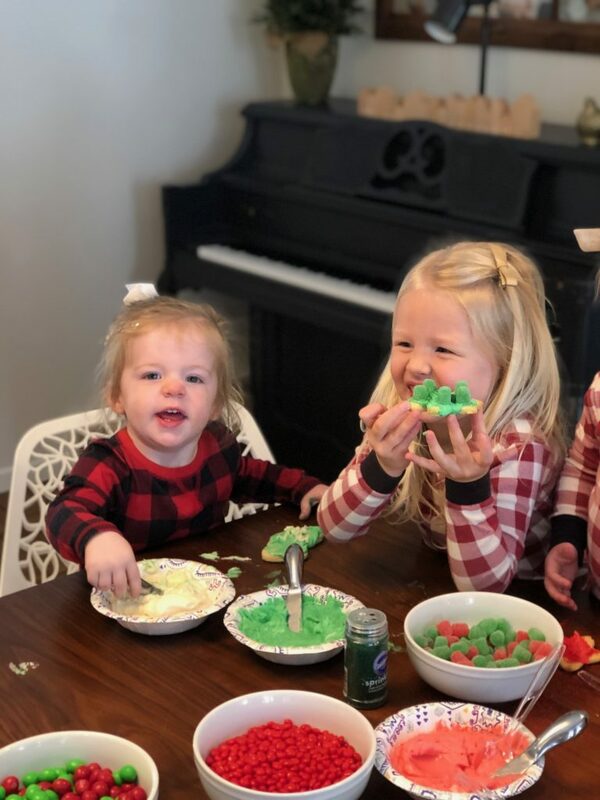 Their extroverted little personalities that would rather be walking around the room talking to strangers and putting on a show rather than sitting quietly at the table coloring a picture. 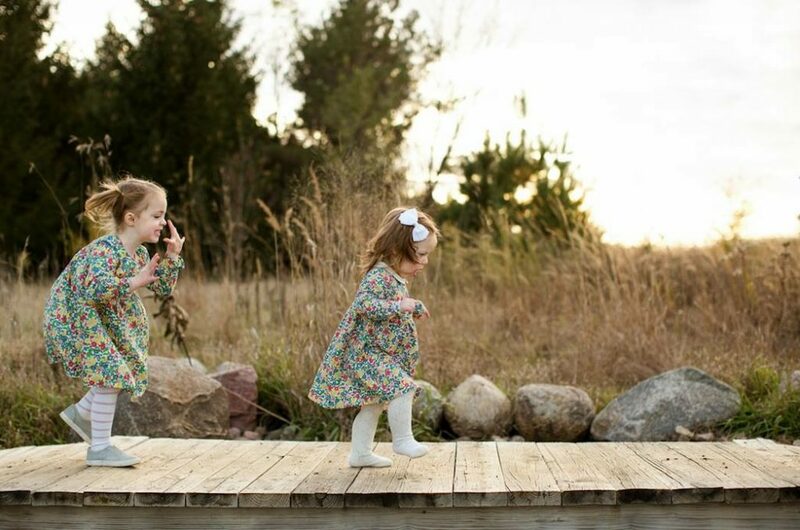 At my best, I’m the confident, assured mom who delights in the challenges and joys of parenting these two girls. Who prays for patience during meltdowns and calmly handles the bumps in the road. At my worst, I get caught up in the trap of the expectations of others, the sideways glances when a meltdown happens in public or my kids are just NOT having it at a restaurant. I’m not saying it’s unimportant to develop skills like obedience, listening, and quiet play, but that there certainly is a large margin of error for letting kids be kids and allowing their unique personalities to shine. Realizing there are areas of improvement to be had at every turn in this job called parenting, but beating ourselves up about it is not necessary nor helpful in the long-game that is parenting. 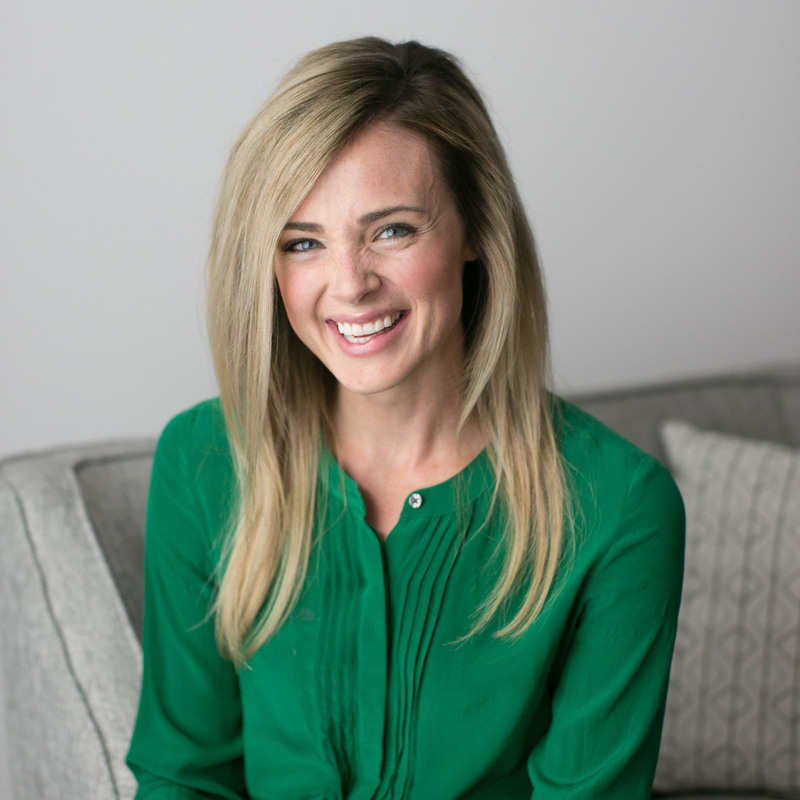 So to my fellow mommas of little kids with big personalities and strong wills, I see you! I don’t just see you, I’m right there with you, chasing my kid around the room as she runs away from me, pulling a crazy, climbing baby off a table, walking out of the room with a mad preschooler, having serious-whisper conversations with a preschooler out in public. It’s rarely easy, but it’s always worth it, and I have a feeling we’re doing just fine. And on the days when we are completely worn down? Well, His mercies are new to us parents of strong willed little people each and every day. Can I get an amen?! I get a lot of questions each week about skincare, which I LOVE. 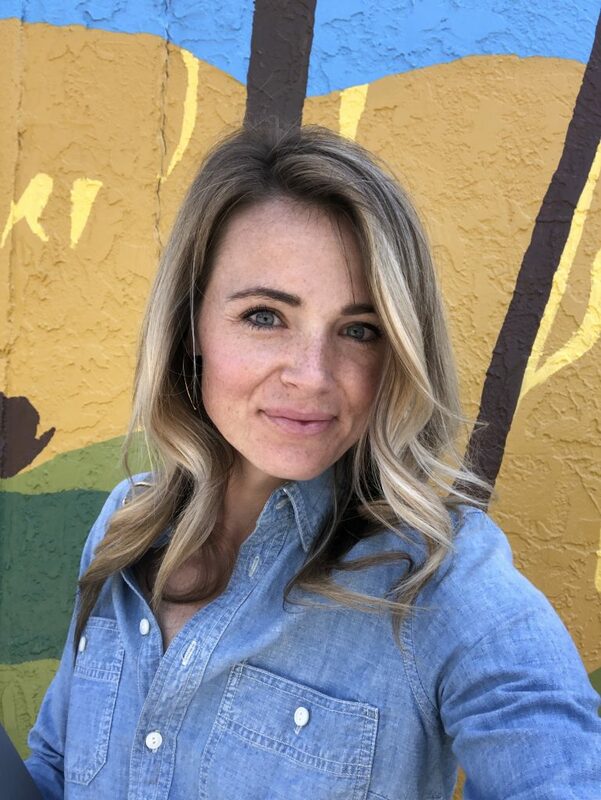 One of my absolute favorite things is to do personalized skincare consultations over email or in person to help people find the perfect products for their unique skin. Over the last 3+ years working with Beautycounter, I’ve learned there is NO one-size-fits-all solution to skincare, and more often than not, it’s a trial and error process to find the right skincare “mix” for you. That said, frequently I’m asked what are my top few “must have” items if someone is interested in refreshing their skincare but wants to start slowly before diving headfirst into the world of BC. So, I’ve rounded up my top 3 favorite skincare products that are (nearly) universally favorable on all skin types. I’ve been loving + using this product since I got my hands on it in May at Beautycounter’s Leadership Summit before it launched to the public. It’s been a runaway hit since it launched in June, and for good reason. What I’ve discovered in my years of working with clients is that most people do not sufficiently exfoliate their skin. Sometimes people even ask me what an exfoliator is! If that’s you, then you’re doing yourself a huge disservice by not exfoliating your skin. Our skin naturally sloughs off dead skin cells, but sometimes (most of the time?) our skin can use a little help in that process if you want glowing, radiant skin. If you apply skincare products to skin that hasn’t been sufficiently exfoliated, you’re also not getting the most out of your products because it can’t reach the under layers of the skin. Most of you are probably most familiar with a mechanical exfoliator – such as a scrub or a tool like the Clarisonic. Personally, my skin has never taken super well to mechanical exfoliation (the Clarisonic and DermaFlash both made me breakout like crazy) but my skin tends to need plenty of exfoliation, which is why the peel as been so great. It gently exfoliates the skin while you sleep using a blend of 15 different botanically-derived acids – some which sooth and plump the skin, others which slough off dead skin cells and help minimize pores, fine lines and sun spots. It’s really so good I could go on and on. Tip: Don’t use it too often! Start slowly – once per week – and work your way up to two to four times per week. I found that twice per week was the right amount that left my skin feeling great without aggravating it. Moisturizers are tricky, and recommending a one-size-fits-all moisturizer is nearly impossible, but the closest I can come is recommending this Balancing Face Oil. Beautycounter’s face oils are what originally drew me to the company. I had done a lot of research about the benefits of moisturizing your skin with an oil, and was looking for an oil that would be a good fit for my skin. I’m SO thankful I found our face oils because the way my skin has improved since embracing natural oils in my skincare has been incredible. While you don’t want to use synthetic oils on your face (like mineral oil, which can clog your pores) using natural oils can be extremely effective moisturizing your skin while helping boost radiance and overall tone and balance. The Balancing Face Oil is great for nearly everyone from those with oily and acne prone skin to those, like me, who have skin on the dry side but can still be prone to a breakout or two every month. I tend to use this in addition to my moisturizer, but it can be used as a stand-alone as well! Another one of the first products I tried when switching over my skincare to Beautycounter years ago was the Rejuvenating Eye Cream. It’s formulated with antioxidants and caffeine to help reduce puffiness around the eye and combat those pesky wrinkles that arise over time. Don’t think you have wrinkles around your eyes? You should still be using an eye cream as a preventative measure! Note: If your primary concern is dark circles, I would suggest the Countermatch Eye Rescue Cream instead. Coming Up Next // Makeup Top 3! It’s been a while since I did an update on the girls, hasn’t it? I was laying in bed just last night, thinking about how BIG sweet Ainsley is! 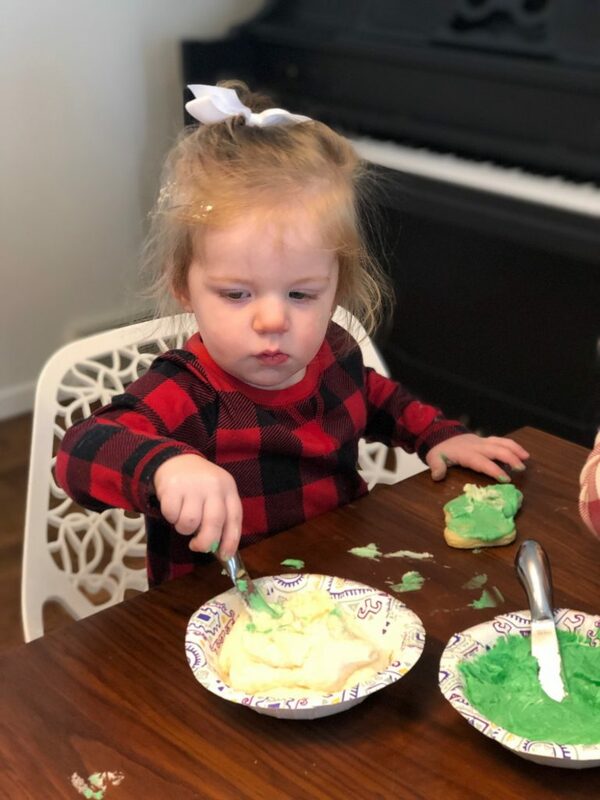 I swear I was just blogging about her pregnancy with you all, and now she is inching up on four years old and suddenly seems so much older now that she is in preschool. And, as mommas of multiple kids know, the second kiddo just doesn’t stay a baby quite as long as the first did. Collins always has Ainsley to push and pace her, meaning this momma is always amazed and a little sad about how very grown up my baby is becoming, too. 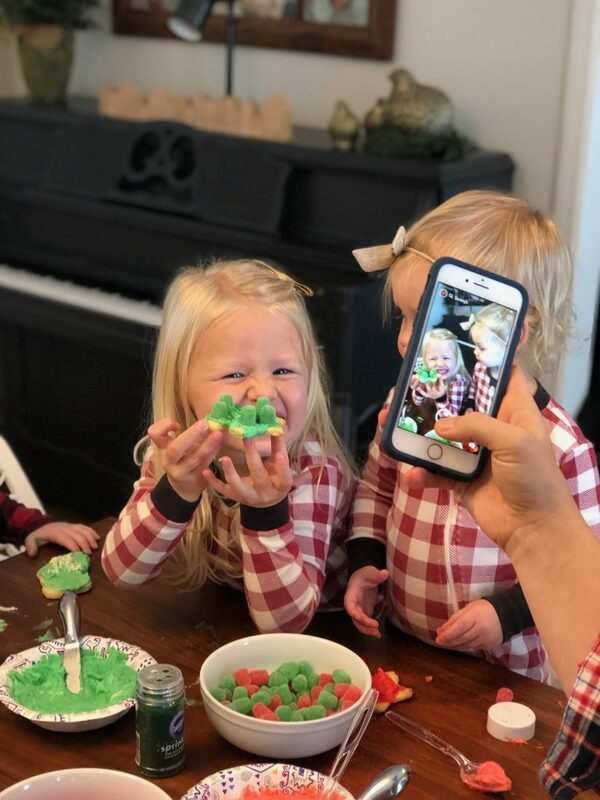 So, in case you’ve been wondering what the girls have been up to lately, here’s a little Hofmeyer family update! -Attending preschool two mornings a week and LOVING it. She asks every day if it’s a preschool day. 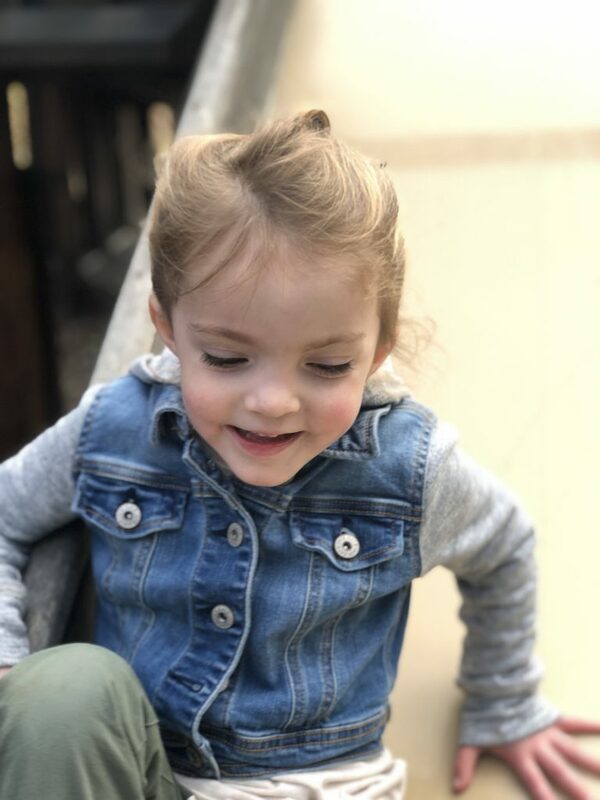 It’s a faith-based 3-year-old preschool and I can’t say enough great things about the decision to send her and all that she is learning about faith and the world around her. -Participating in her first year of dance! I said I would never be a dance mom, but like all things in motherhood, you tend to eat your words in favor of what your kids want and desire. -I know all parents think their kids are smart, but I’m always amazed at this kid’s power to reason. She is so curious about the world around her and how things work and I LOVE her little mind and the way it works! -She is TALL. I suppose that doesn’t come as a surprise to anyone who knows me + Joe in real life. We’re both tall so our girls are following suit, always in the 90+ percentile. -Wishes she was attending preschool like Ainsley. Ha! But seriously, I think this kid would happily attend preschool if they let mom come with. -Which comes to my second point about Collins. She loves people, but she REALLY loves mom, which makes things like leaving her in church nursery r with a new babysitter quite difficult. Thankfully we have a handful of trusted caregivers that she loves and that I can easily leave her with without major tears. -She is a climber! Ainsley was not a climber, so this is new to us. She climbs on EVERYTHING. She is very content to climb onto the dining room table and sit there for the longest time, just happy to be on the table. See also: She has a lot of bruises from trying to climb on all the things. 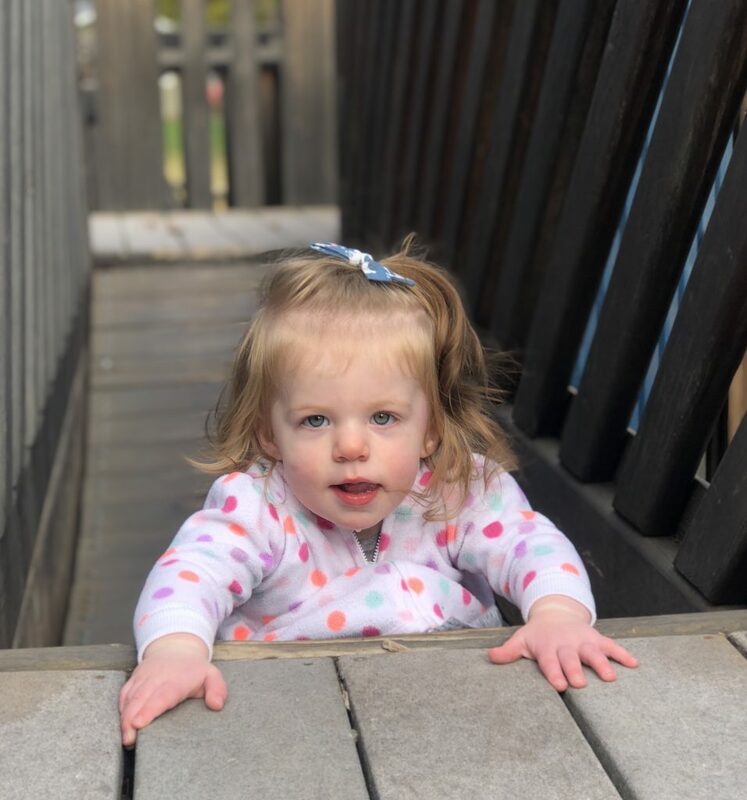 -Collins is also a pretty physically advanced kid (see above point) and does well keeping up with her sister, running/walking everywhere and trying to track down Ainsley. -She understands nearly everything we say to her, but doesn’t talk a lot yet. Her vocabulary has grown since getting tubes (yay for passing her hearing test!) and she currently clearly says “Mama” “Dada” “Pippa” (sounds like Bopa), “Ainsley” (sounds like Cece), “Mimi” “Nana” “Papa” and more. This season of life with the girls, while busy and crazy, is just SO incredibly fun. I find that I always feel I’m hitting my parenting stride in any stage when I’m getting SLEEP. So now that both girls are very consistent sleepers (though very early risers) it’s much easier for me to enjoy their ages and stages because I’m well-rested, too. We are able to up and go so much more easily than we have been able to in the past, and they are great travelers. Both our girls really love being “on the go” so I’m thinking it’s their way of telling mom and dad that they want to travel to more places. Noted, children! I’m so thankful for their joyful spirits and what a gift these two are to their parents! We love you, Ainsley and Collins!